Hello. We have to raise the grading at the back of our backyard by about 2-3 feet. We have 5 young Japanese Lilac trees (1-2 years old) planted there and I was wondering if it was safe to raise soil level around these trees and if not, can they be safely replanted? Thank you. Thank-you for consulting Toronto Master Gardeners. You are correct in your concern about building up the soil level around your trees. Tree trunks should not be buried in soil and adding 2 to 3 feet of soil would likely cause the death of your lilac trees. Ensuring that the soil level does not come higher than the root collar (where the roots begin to spread out at the bottom of the trunk) is a key aspect of successful tree planting. 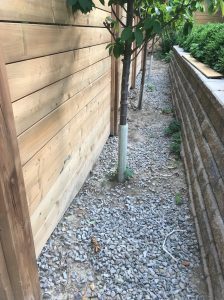 While it is not ideal to dig out and replant your established trees, they will certainly have a better chance than they would if their trunks were buried. Lilacs are hardy plants and your relatively young trees have a good chance to survive. Spring or fall are the best times to transplant trees (if you have that option). Do not prune prior to transplanting. Choose a new spot with good sunlight; at least 6 hours per day. Ensure the location has good drainage. Dig a wide hole around the base of each tree, getting as much of the root system as possible and keep as much soil on the roots as possible. Dig a hole in the new location that is two times wider and the same depth as the root ball. Do not add topsoil or compost or other soil amendments as this will limit root growth to the prepared “pocket”. Do not place soil above the root collar. Fan the roots out and refill with the original soil. Press down gently and firmly. Water thoroughly and deeply about every day for the first two weeks and continue to water every two to three days for the next couple of weeks to encourage the roots to re-establish. You will not need to stake your trees. For detailed instructions on planting trees, please have a look at Planting a tree: A Toronto Master Gardeners Guide (link below). There is a section that specifically deals with planting depth.